V:III_2.2 [TLL] WS2 [C1] Workshop Programme & Results "Sustainable and Renewable Source Component for Building a City"
V:III_2.3 [TLL] WS6 [C2] Workshop Programme "City for Living, Living in a City"
Tallinn | Since Estonian independence in 1991 and the opening of frontiers towards Western Europe, the dynamic transformation of the North-eastern city has reinforced building and demolition activities. The search for a new cultural identity balances in relationship to the rich historic built heritage of the 'old Hanse town' and with regard to metropolitan areas of Europe. Essential changes are currently taking place in the urban substance of the 19th and 20th century. In particular, the opening process of the coastline – a former military border, the transformation of the existing and the qualifying of the prefabricated building areas pose acute challenges for processes of re-thinking the city. I remember my first meeting with Dagmar Jäger very well. I was in Berlin in autumn 2010, at the session of the German Academy of Arts, when the historian of art Carolin Schönemann, who was working in the Department of Architecture at the Academy, told me about a project called Reiseuni and asked me whether the idea seemed interesting to me and if I could spare some time during the break of the session to meet with the author of the idea, architect Dagmar Jäger. That is how we met. It was late in the evening and to be honest I was tired after a long day and had agreed to meet for politeness' sake rather than out of interest. Dagmar Jäger spoke fast and enthusiastically about the idea of setting up a Master's Programme in architecture at the Brandenburg University of Technology, based on universities in various countries working together. Specifically, on actually working together, with students "traveling" from country to country, from university to university and with the teaching therefore being based on the preparation of designs at architecture schools with varying traditions and curricula. This concluded our first meeting. The effect of the chat however was, that I could not fall asleep that night, my mind reeling with thoughts about the idea, which at first sight seemed fairly unrealistic and requiring a lot of experience in organising. At that time, I was the Director of the Institute of Architecture at the University of Applied Sciences in Tallinn. Our school had big ambitions for its future back then. 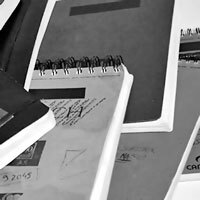 Training at a good level, a cohesive and active body of teaching staff and, furthermore, a recommendation from an international accreditation committee in our opinion were sufficient grounds for launching a Master's Programme in architecture. The rector of our school back then, Professor Arvi Altmäe, PhD, an architect by training, supported the plans at our institute and we thus were a reliable cooperation partner to start the international project together. Dagmar Jäger's invitation to participate in the project was tantalising, interesting and new and it seemed that it would open up entirely new opportunities for those studying architecture. My colleagues at the school agreed and so we responded in the affirmative. Only one month later, Professor Dagmar Jäger was in Tallinn, meeting with the school administration and the students and that is how it began. Only now, recalling our first meetings, do I realise how big a job had already been done by Dagmar by that point. Our students were very interested in the idea and so the autumn 2010 saw six students beginning the Brandenburg University of Technology Master's course in architecture, Architektur.Studium.Generale. They were Üllar Ambos, Jaan Kuusemets, Kaisa Lasner, Erko Luhaaru, Pille Noole and Raiko Reinson. The first 6-week workshop at a partner school was ours to organise in January and February 2011. This was no small challenge – The workshop in Tallinn was the first workshop abroad after Germany, we were the first partner school. Structuring the programme and organising the work was our job and our decision: offering the second project workshop with our specific focus and approach, we had few examples to follow by previous experiences. 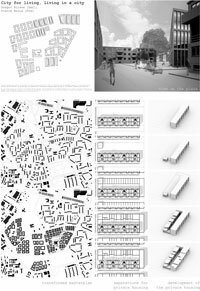 The choice of the main topic was decided by my interest, increasingly deeper over the recent years, in how we could use the accomplishments of today's research to shape our living environment, given the objective of creating an urban space that is sustainable within the conditions of social and urban contexts. Dealing with the future development of cities, mostly Tallinn, on all scales for decades, the topic has meanwhile been my interest for years; also, prior to the international workshop, I had supervised a term paper developing the topic and participated with my architectural firm in an international architectural design competition in Finland for the design of Henna, an energy- efficient and environmentally friendly city of the future with a population of 50 thousand. As the objective of our entry, we set the preparation of an analysis drawing on the possibilities for the sustainable management and conditions of the existing urban environment, taking into account present-day knowledge and possibilities for exploiting natural resources. Is it possible to balance the existing natural resources and the resources necessary for the existence of the human being? How? What urban planning designs lay the groundwork for the renewal of resources and for the creation of new assets? 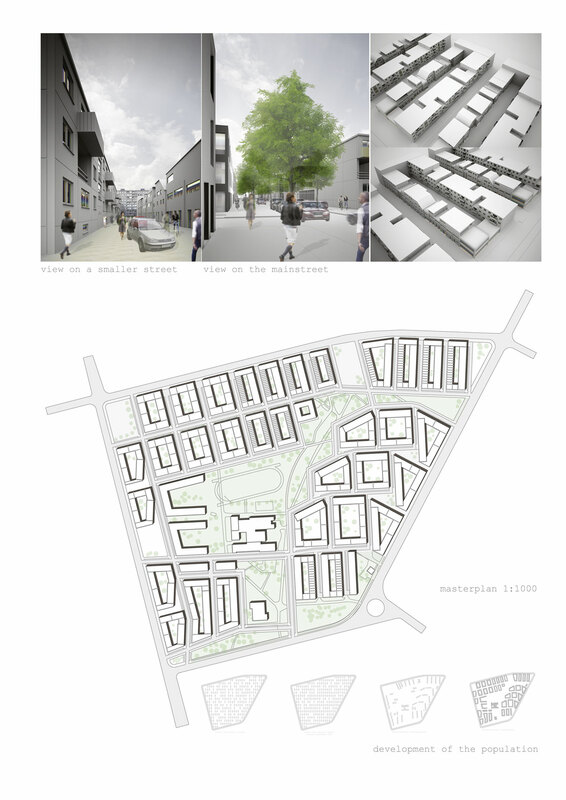 We focused on the derivation of the size of a MODULE, an environmentally sustainable, energy-independent source component of the urban structure, based on an analysis of for example a residential city block or the public space linking such blocks, and analysed whether and how it is possible to contribute to resource renewal by means of urban planning designs. I remember our first meeting with the students in the course in Cottbus in November 2010 and the response of the students to my presentation on the main topic of the workshop in Tallinn held in the frame of the opening conference, the first "European Architecture Dialogue". Kassem Eida, a student from Lebanon, looked at me with deep astonishment and asked how they could be possibly required to address a topic like that in a period as brief as six weeks. After the defence of the projects for the Tallinn workshop, Kassem came to me to recall the question and my answer, which was, "that is ok, use the experience not just from the six weeks but from your entire lives up to today." This I did not remember, but he did. The fact that students took such a global view of the environment and its issues was as expected, yet astonishing at the same time. The issues of the day and giving thought to the future of the plant, EARTH were the main axis of every project. However, the fact that our discussions and recommendations would range from India to Africa to the Arctic and from Lisbon to the Lasnamäe dormitory district in Tallinn came as a surprise. The topic struck a chord and the workshop results were very interesting. The workshop for the second intake for the Master's Programme was held in Tallinn from 3 September to 20 October 2012. In the meantime, our partner school had changed: Tallinn University of Technology concluded the collaboration agreement with the Brandenburg University of Technology in 2011. There were several reasons for the change in the partner school. However, the main reason was the fact that the Master's Programme in architecture was launched at the Tallinn University of Technology and the university administration supported the idea of collaboration based on an international consortium in every respect. In the transfer from one school to the other, there was a contribution by me, too, as I had been invited to become a visiting professor at TTÜ, where Professor Rein Murula and I prepared the re-launch of the architecture programme, now up and running. 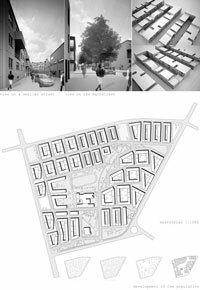 For the main topic of the 2012 Tallinn workshop, we picked the analysis of "Linn Elamiseks, Elamine Linnas" [A city for living, living in a city], to dedicate the work to the future of residential blocks proposed and built in the 1960s, drawing on the MUSTAMÄE residential district in Tallinn as its example. We posed these questions: How fast does urban space age? When do processes of transformation and renewal begin? What are the factors influencing how these changes come about? What is our vision of how to design and plan the living environment in our cities, so that we could claim that this is a city, which is good to live in, that this could be a better "City for Living"? According to the German philosopher Oswald Spengler, the city is the environment of the genesis and evolution of culture – a condition born and dying with culture. One cannot but to agree with this thought. In 2005, Prague hosted a European Union Ministerial Meeting on the "Living quarter for living". Statistics indicate that 70% of urban residents in the EU are living in concrete panel apartment buildings. In the EU, the funds needed for the rehabilitation of panel apartment buildings is estimated at 35 billion euros. From 2007 to 2013, the EU Structural Fund provided approximately 5 billion euros annually for the reconstruction of panel apartment buildings. That is a lot of money and as a result, of course, there has been a lot of discussion and also action concerning this issue. However, again and again the question arises: demolish or rebuild? In the opinion of many, the massive amount of construction of panel apartment buildings is an architectonic crime. However, there are also other views, justifying this activity as a speedy and efficient option for addressing issues related to apartments in growing cities. In every country, there are issues to resolve the future development of districts of panel apartment buildings, not at last because of the fact that the facilities and people's expectations for the quality of the living environment have changed and need to be adopted. On the one hand, boring due to big scale, missing differentiations by undetailed building frontals and anonymity for lack of community or adequate open urban spaces and, on the other hand, sound-transmitting walls between apartments, leaving no choice but to participate in the neighbour's life, combined with dilapidated infrastructure, are the main reasons why the image of the so-called "paneelikad" is poor. Nonetheless, the structural state of these 1950s buildings and the related issues are currently also very important. The engineering condition of the buildings requires that they should be renovated since the issues are getting worse, and in 10 to 15 years we will face a situation of the buildings collapsing. About 50% – 60% of Tallinn's residents are living in concrete panel apartment buildings. At this time, it seems financially impossible to demolish all these buildings. It is very convenient to disparage living in a panel apartment building. However, as long as people pay more importance to what is inside than to the outward prestige, action is required. The specific Estonian challenge is, that apartments in panel buildings are privately owned on a large scale, as a result of which the rehabilitation or demolition of a building requires the owners' consent. One cannot rebuild or, what is worse, demolish someone's home forcibly. Consequently, any upgrade of these city districts will require new laws and regulation as well as the securing of the financial wherewithal. Mustamäe, like other modernist residential blocks erected from the 1950s to the 1970s, is characterised by the conception of the function characterizing a residential district: the inhabitants needed infrastructure for the travel to work, pupils have short ways to school, the people should easily find a nearby district supermarket and then easily reach their home to watch TV. The key asset was the suitable position of buildings in relation to the sun, in order to ensure sufficient illumination. Compared to the present-day tenets, there was little or no engagement with the public space or its quality. Plentiful green areas were supposed to ensure the quality of the urban space. The existing street grid as the backbone of urban space was broken and replaced with a freehand pattern, for which support is said to have been found, even in the designs on the belts of traditional outfits. The freehand plan of Mustamäe is supposed to have been inspired by Estonian traditional belt designs, which should even convey a secret message. With the benefit of the experience, we now know that the biggest loss in the freehand space was the disappearance of the traditional street from the modernist residential block. It is the street that is a very important space in urban planning terms, able to sustain the function of public space, making the activities of daily life possible while at the same time creating new contacts and ways of interaction, which significantly increase people's options for social activity. Is it possible to restore the traditional street, whilst preserving the existing modernist residential district? Were there any alternatives to demolition? There are no turning houses back around to line streets and roads. There is the option of lowering the total height of the building, which has been tried in several countries. This would, indeed add value to an individual building but not change the quality of urban space overall. 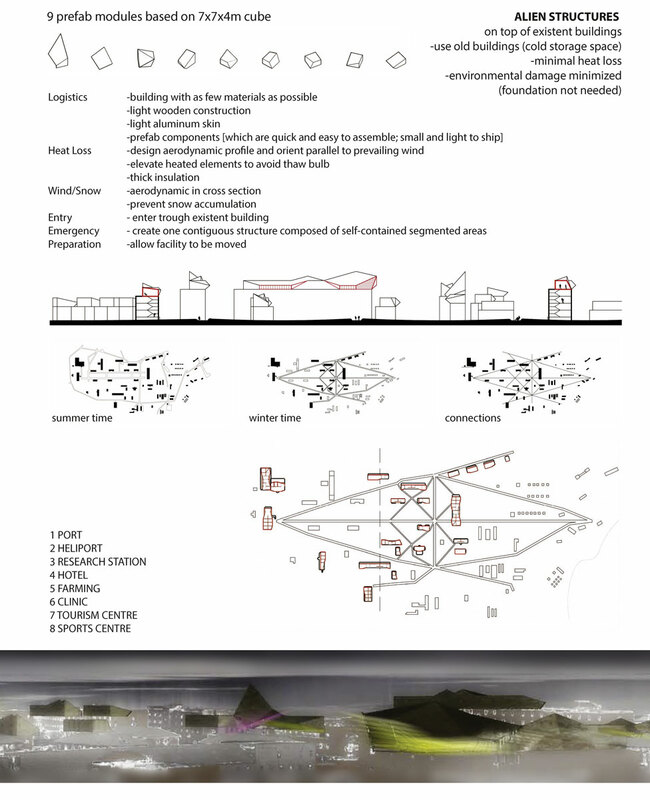 In our work, we first and foremost concentrated on an analysis of the existing living environment and attempted to find various options for improving it in the particular urban space of Mustamäe. We analysed the positive facets of the living environment of Mustamäe, specifically the factors affecting the evolution of the city district, the existing jobs and their effect, or the impact and value of the green areas that have evolved on sandy downs over 50 years as well as other circumstances contributing to the value and development the living environment. We dreamed but also discussed realistic possibilities, concentrating on shaping an environmentally sustainably urban space to the best of our abilities. On their first encounter with Mustamäe, our visiting students were surprised. A sunny September morning lifted the spirits. We had had yet another rainy summer, with people complaining that there had been little sun and warmth. However, nature was happy. In spite of the autumn, Mustamäe was green and fresh. In recent years, the facades of most buildings have been fixed up / thermally insulated and entryway doors and balcony barriers have been replaced. So the first impression was rather on the positive side than what our students from Mexico, France, Germany, Israel and Spain had pictured. In our work, we started by asking students from eight countries to describe the tradition of a home in each of their respective countries – what is meant by "home". Subsequently, our work benefitted from this discussion a great deal; we sensed how different we are, whilst recognising that we have a lot in common. Preserving traditions and accepting different views is the lynchpin of my creative activity and teaching and it is this that we strove to hold up. The second topic of analysis was to look for examples of the reconstruction of panel apartment buildings from other countries and to analyse what had been done. What had been done and what is being done and forming a position of one's own based on that. Endrik Mänd, Chief Architect of the City of Tallinn, and Mati Heidmets, Professor of Sociology at Tallinn University, shared their thoughts, research and insights with the students. The architect Kai Süda profiled the history of the city district of Mustamäe, 50 this year, and recalled her childhood in a 9-storey panel apartment building in Mustamäe. And so we got to work. Every week there was a scheduled review, which provided the students with an opportunity to continually share their thoughts and ideas as well as hear and see those of others, assisted by our team of teaching staff, the architects Rein Murula, Ignar Fjuk and Emil Urbel, and the visiting landscape designer Donata Valentien from Germany. Same as with the first intake for the Master's course, with this group too we completed another smaller project in between, for variety's sake and to keep up the pace: designing a Tallinn street, Roosikrantsi, into a pedestrian street. There was excitement and there were thrilling ideas. 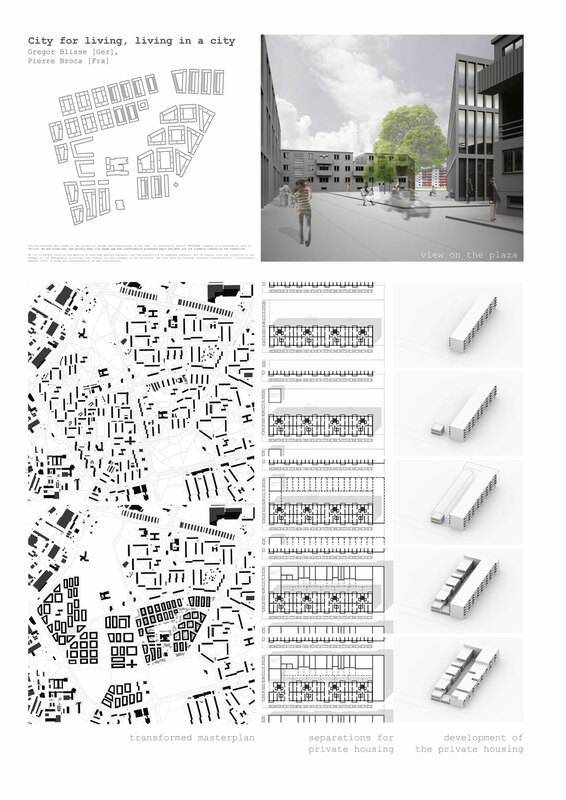 In the project by Marine Tillet / Antje Heyman, there were simple and feasible ideas to be able to achieve a very pleasant urban space, whereas Paulina Lopez / submitted an innovative and bold design for urban space spanning multiple planes. I sensed again how productive a creative process based on frank and honest discussion can be, complemented by competitiveness in a good way. Six weeks is both a long time and a short time, but also at the same time just enough to prepare a succinct analysis-based architectural design solution and do a high-quality presentation. At that occasion, the workshop resulted in seven future designs for Mustamäe. Architektur.Studium.Generale has proven a project on which we, partner schools of the Brandenburg University of Technology, believed in and devoted our knowledge and time to. Three years of work behind us, we have become a strong team and it could be said that we are even more than that, a group of friends. There has been a learning curve not only for the students but also for us, their mentors. At our meeting during the interim reviews, we sensed that our approach to going about various urban planning and architectural designs is different. However, we have always been united by respect for other work methods and by love for our area of specialisation, architecture. It is for this reason that, during our encounters, we have devoted so much time to topics of interest to us and felt that it is still not enough. 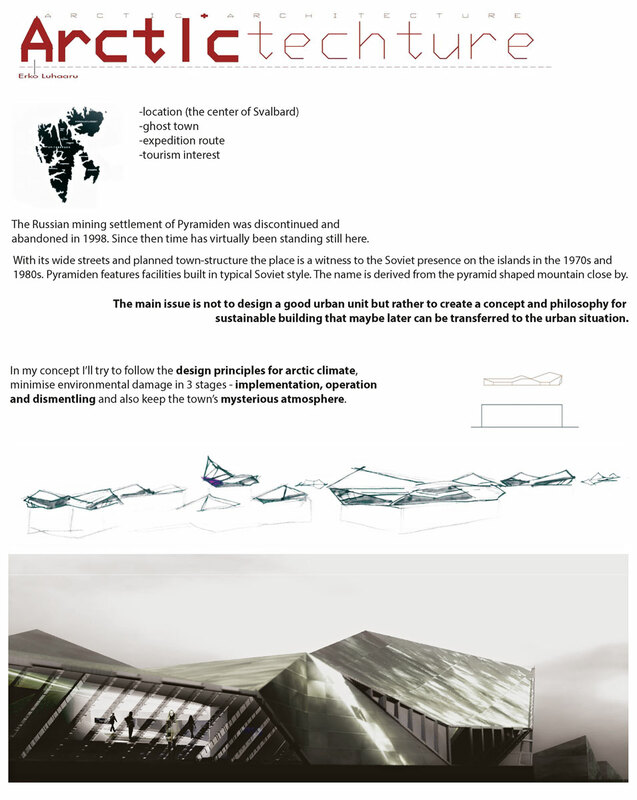 The experience gained by students who have participated in the Architektur.Studium.Generale programme is invaluable. By working at various architecture schools during their studies, students have the unique opportunity to delve into local issues, hear lectures by specialists in their field and prepare designs under the guidance of well-known architects. The idea of A.S.G., building on the idea of dialogue is one of a kind and very successful, for the fame of the programme has spread worldwide – how else besides students from Europe could we also have students from South Korea, the United States, Israel, Iran and Bangladesh. In my home country, Estonia, people believe in the future of the European Union, above all for the reason that only together are we able to make the life around us better and safer. More than anything else we need to act smart and learn to keep being considerate and help where help is needed. By helping I mean, first and foremost, thinking, erudition, ability to appreciate the traditions of one's people and take note of those of others – learning to listen, look, think and only then, act. In the world, every day thousands of meetings are held, conferences, symposia and summits, which a lot of people attend to. Specialists from various countries with varying cultural, educational and social backgrounds meet, talk for a couple of days and part ways. Does it make a difference? Certainly opinions vary. However, I tend to doubt the usefulness of it yet at the same time, I am deeply convinced that it is necessary to meet, listen and talk. We have begun with a dialogue, Architektur.Studium.Generale, as a result of which architectural designs are produced, each in their own way offering new value, a new and better future environment for our people. These designs are completed as a result of a thorough, methodically conducted analysis. First, students with their supervisors have found out more about the location, the story of that place, no matter how far flung in the world it might have been. What is it for them? Why not simply draw a pretty city or building? But it is precisely when a student from Greece or South Korea pursues her/his thesis project in Tallinn and a student from Estonia does her/his work in Tel Aviv, that the kind of looking, listening, learning and considering others' wishes which we time and again lack on this planet, Earth, takes place. The years during which Professor Dagmar Jäger, all the other professors, our helpers and, needless to say, our students and myself have been involved in this project have persuaded me that we have embarked on a project that is precisely what Europe and why not the whole world is expecting from us. Repeatedly I have wondered, that if this project is not needed, what kind is then? I am proud to say that this is our project and I am certain that you will agree with me. with International Master's Programme A.S.G. / Reiseuni_lab, Module "Project & Construction"
Today, an environmental approach requires designers to rethink the scale of an architectural/urban site – a building/city must be understood as situated not only in a specific territory, but also in relation to a much larger and more abstract global environmental system. Therefore, architectural decisions should be made in such a way, not to produce desired effects, but rather to avoid negative ones. 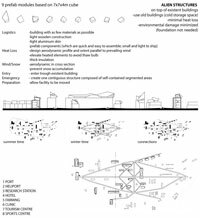 Particularly when operating in arctic areas, the architect must understand and propose tactics for designing – not only the architectural object, but also its implementation, operation, and even its eventual destruction. The main issue in this project was not to design a good urban unit, but rather to create a concept and philosophy for sustainable buildings that maybe later can be transferred to the urban situation. The concept was to work with an idea of introducing the term of alien; something, which is not there – something, which differentiates from its environment. Alien refers to the idea of conquest/approach of a new society and changes in the place. 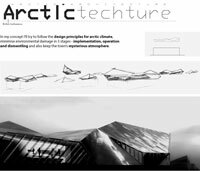 The basic idea for philosophy was to avoid effects from environmental and visual-atmospheric point of view; it was to use new design principles implemented from long experience of building Antarctic stations. Architecture is described as slow process that stumbles back after its realization, while the time goes on. 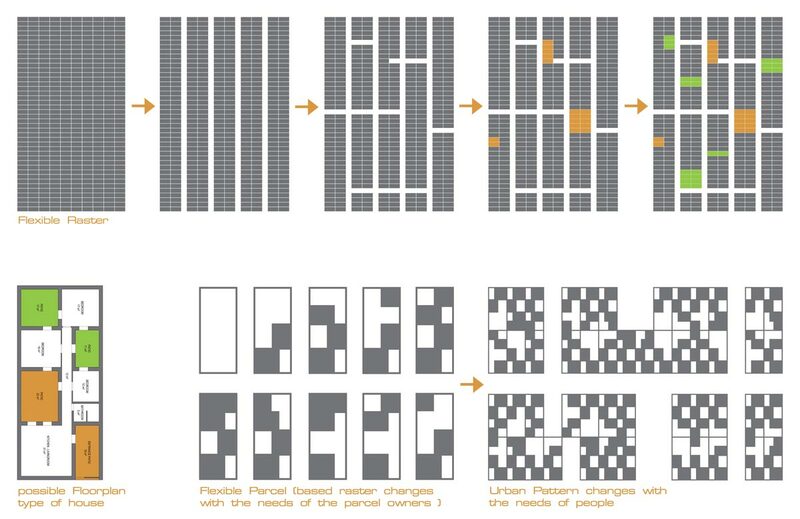 Can we re-design the process of architecture?" 14.00 – 17.00 Lecture of architect Martti Preem " The development of Estonian´s population system, todays problems and Challenges" lecture by Pirjo Vanem " E- State"
Tallinn's workshop deals the future for design and construction of the 1960's residential quarter MUSTAMÄE, an example of a typical residential area in Tallinn at this period. The main questions, we will deal with in the workshop: How quickly does cityscape age, how do transformation processes start and what are the elements influencing the transition? We first try to focus on the quality of the existing by spatial and constructive analysis, to research on the possibilities of renewing, but of course we also have to consider and pay attention to optional changes in the demographic development of this quarter, the reasons for such changes in the structure and finally the real and resulting need for housing; we have to consider economic considerations, in particular, whether there is a scope for reconstruction or new construction. In 2005, the European Union Ministerial Meeting was held in Prague on "Living-quarter for living". Statistics say that 70% of the urban population live in panel buildings. The European Union accounted an amount of EUR 350 billion for the reconstruction of apartment blocks. 2007 - 2013 EU Structural Funds granted apartment block reconstruction support of approximately 5 billion a year. This is a substantial sum of money and therefore, is of course strongly discussed again and again, raising the question: whether to demolish or better to reconstruct. The massive construction of apartment blocks many people considered a crime over architectural tone, but there are other opinions by which this action is justified as a quick and effective way to solve the problems of growing urban need for living space. Problems with the panel housing in a residential area persist in each country, however most specifically, due to the relatively low level of expectancy upon quality of housing in such areas. Long, boring, detail-free construction facades, the anonymity of the big city on the one hand and on the other hand thin walls between the apartments, whereby one will inevitably have to participate in life-I am a neighbour and worn infrastructure are among the reasons why the reputation and image of such housing is low. However, it is very important today, 50 years after construction, to know and understand the constructive qualities and related problems of panel houses. Technical conditions of the buildings require renovation as the problems get worse and after 10-15 years we will reach a situation where the houses are likely to collapse. 50 to 60% of Tallinn's population lives in panel houses. Demolition of all the houses seems to be economically impossible today. Experiences living in the panel may, after all, disparage, but as long as people are more important than the content of external prestige, it must be taken into account and integrated into the process of planning. The biggest issue at hand is that the panelled apartments are mostly privately owned, so the rehabilitation or demolition of buildings needs a majority of owner's consent and public and policy interest in order to pass legislation and create economic opportunities. After all, it is not possible to force to reconstruct someone's home, or even worse, to demolish it. We particularly concentrate the work on the existing environment and try to find different options to improve the urban situation and settlement of Mustamäe. We analyse the positive aspects of living in Mustamäe, in particular the factors affecting the development of the district and their impact on existing jobs, the 50 years of formation of greenery and increased impact and value of habitat and others, like social values of growing neighbourhoods as well as other pro-development conditions. We are trying to dream, but with real possibilities in mind, focusing on sustainable urban environmental planning. Jan Gehl "Life between buildings", the first edition dates from 1971.